See Jane Cook is a free weekly Internet food newsletter written by Jane Snow and published by Mimi Vanderhaven. Sign up at www.janesnowtoday.com to have newsletter appear every Wednesday in your email in box. Join us! Please note: If your email address changes this year, you must re-subscribe to my newsletter in order to continue receiving it. Mimi’s minions cannot change the address for you in our email list. The procedure is easy. Just click on the “unsubscribe” link at the bottom of a newsletter. After you have unsubscribed, go to my website, www.janesnowtoday.com, to sign up under your new address. Thank you. How can such a simple recipe – three ingredients and a crust – produce such a spectacular dessert? You will want to print this and make it for Thanksgiving. Don’t hesitate. Just do it. Tarte Tatin Aux Poires is a glistening, golden-brown upside-down pear tart. The quartered pears embedded in the flaky pastry are glazed with a butter-rich caramel. 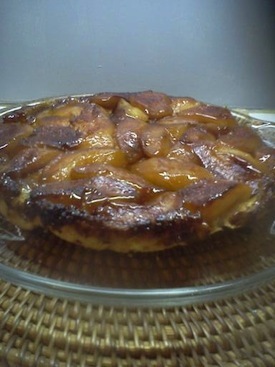 The dessert is based on tarte Tatin, the classic French upside-down apple tart. This pear version, from Patricia Wells’ “Bistro Cooking,” is even easier to make than tarte Tatin, in which halved apples must be arranged just so. Here, peeled and quartered pears are caramelized with butter and sugar in a skillet, then dumped willy-nilly in a springform pan lined with foil. The pastry is draped over the pears and tucked down the sides. In the oven, the pastry swells and fills all the nooks and crannies between the caramelized pears. When inverted onto a platter, the glossy pears are nestled like gems in the enveloping pastry. The French butter pastry – pate brisee – comes together quickly in a food processor. It may be made well in advance, and in fact is best if it rests at least an hour in the refrigerator. Wells suggests baking the tart in a “10 1/2-inch clear-glass baking dish or a special tin-lined copper tart Tatin pan. Since I don’t have a glass baking dish in the proper shape, and Le Creuset’s non-copper Tatin pan is $110 from Williams-Sonoma, I think I’ll stick with my makeshift foil-lined 11-inch springform. It worked just fine. Make the pate brisee, wrap in waxed paper and refrigerate for at least one hour. In a 12-inch heavy skillet (I recommend cast iron), melt the butter. If you do not have a 12-inch skillet, use 2 smaller skillets, dividing the ingredients. Stir in the pears and sugar. The pears should fit in a single layer. If not, remove some of the pears. Cook for 10 minutes over medium heat, stirring carefully from time to time so the pears and sugar do not stick. Increase heat to medium-high (the directions specify high heat, but I was afraid the caramel would burn). Cook until the pears and sugar are a deep, golden brown, about 15 to 20 minutes longer, shaking pan or stirring often. Allow the caramel and pears to become a true deep brown but do not burn. Pile the pears into a foil-lined, 10- or 11-inch springform pan. Roll out the pate brisee slightly larger than the pan. Place the pastry on top of the pears, tucking a bit of the dough around the edges and down into the pan. Bake at 425 degrees on the center oven rack for 35 to 40 minutes, or until the pastry is a deep golden brown. Remove from oven and immediately place a heatproof platter top-side down on the pan and invert the tart onto the platter. Tap the bottom of the pan to release any pears that may stick. Slowly remove the pan. Serve warm or at room temperature, passing a bowl of crème fraiche or sour cream, if desired, to spoon over the tart. Makes 8 to 10 servings. Kevin Scheuring, who makes the case for Texas chili in a letter below, is The Spice Hound, a local purveyor of bulk spices at reasonable prices. He carries dozens and dozens of spices, from Himalayan pink sea salt to Caribbean hot curry, most of which he packages and sells in $1 portions. Kevin’s spices can be found year-round on Saturdays at the Coit Road Farmers Market at Coit and Woodworth Roads near 152nd Street in Cleveland. For a product list and other market locations, check out his website http://www.spicehoundcleveland.com. I rarely eat anything fried and almost never fry anything at home. So, my version of Brussels sprouts involves slicing each sprout into 1/4 – inch slices. I put them in a baking dish, and drizzle them with olive oil. Sometimes I toss in bacon, walnuts, and capers. Salt to your taste then roast, stirring so they get evenly cooked, and even a little crispy and brown. Drizzle with balsamic vinegar reduction just before you serve. They are nice and crispy when they are fresh — not so much the next day. Dear Cindy: Your sprouts sound great. They would be a nice side dish for Thanksgiving. Hi Jane, here’s a tip for your readers regarding baking a pumpkin for pie. I found that a grapefruit knife works very well to separate the strings from the pulp and the pulp from the rind. Slice the cooled pumpkin into strips no wider than the blade and run the serrated, curved knife along the flesh to pull off the strings. Sometimes the pulp pulls away from the rind without scraping a knife between the two. Dear Debbie: What a great idea. Now I have to go buy a grapefruit knife. I own a zucchini corer and a mint muddler but for some reason, no grapefruit knife. and it is the best!! My whole family loves it! I especially enjoyed reading your comments in today’s newsletter (11/12) on making chili. Since you published it in the ABJ in 2004, the following chili recipe is the only one I use, and I usually double it and freeze much of it in portions for a quick meal over rice, spaghetti or salad greens, as a pizza topping or all by itself. Now that we’re no longer eating meat, I just leave it out and add a can of black beans. Best chili recipe ever. Brown ground beef and onions together in a large pot. Spoon off some of the fat, leaving some in for flavor. Season with salt, pepper, chili powder, cumin, cinnamon, oregano, coriander and cayenne. Cook and stir over medium-high heat for about 2 minutes. Drain juice from tomatoes into pot. Dice tomatoes and add to pot. Add beans and stir well. Stir in chocolate and brown sugar. Reduce heat and simmer, uncovered, for about 30 minutes, or until flavors are blended. Dear Janice and Dan: I’m flattered, especially since a few eyebrows were raised when I first created the recipe (chocolate? cinnamon?). I still love it, too, although I’ve been on a quest lately to clone Acme’s Cactus Chili. I like to challenge people to make a pot of chili without any tomato at all. The sauce is made with whole dried chilies that have been rehydrated and pureed. Ancho, New Mexico mild, and guajillo are great choices and make a great sauce without any need for tomatoes. This can be a real eye-opener for people who think of chili as a spiced tomato sauce. Chili is best when tomato is never more than a supporting player. Dear Kevin: Now you’re talking like a Texan. I’ve had Texas chili in Texas and have even made it myself (no beans, thickened with cornmeal the cowboy way). While I concede that historically it is “real” chili while ours is merely a pretender, I prefer our fake tomato-based version. Real Texas chili can get bit too real for me. Eyes aren’t the only thing it opens, if you get my drift. While my heart and home are in Akron, my husband and I have lived in Shanghai, China since January 2013. It’s been a great experience — but of course, I have a food question. I quickly realized when I came here that egg rolls as we have in the U.S. aren’t offered here. (Or if they are, I haven’t been able to find them.) I did get over that craving and have moved on to doufu mapo, dan dan and xiaolongbao. So is this spicy mustard a Chinese, Japanese or Asian condiment? Dear Holli: I am so jealous. Have you eaten any red-cooked Chinese dishes yet? How about Shanghai soup dumplings – the kind where the soup is INSIDE the dumplings? They could replace your egg roll craving. My husband the sushi chef says the mustard you were served was Chinese, not Japanese. He grew up in Japan and apprenticed in Tokyo, and never came across the mustard there. And to clear up your confusion, a hibachi is a charcoal grill, while teppanyaki is a table with a flat metal griddle built in. Typically, chefs cook your meal on the griddle as you watch. Benihana was a pioneer of teppanyaki restaurants in the U.S.
We just finished a jar of Wickles Pickles that we bought at Root Candles in Medina (of all places). Truly delicious. Dear Mike: Thanks for sharing that info. I’ve gotta get me some Wickles Pickles. Please tell your friends about my Facebook page at https://www.facebook.com/pages/See-Jane-Cook/485076374882661. A link to this newsletter is posted weekly on the site. And don’t forget about my new blog site (https://janesnowtoday.wordpress.com/), where you can find not only each week’s newsletter but archives of past newsletters and more and bigger photos. The only way Mimi and I can keep this newsletter going is by increasing the number of readers in order to attract underwriters. Please share this newsletter with your friends and urge them to subscribe. It’s free! If you have a food question, recipe request or comment, E-mail Jane Snow at jane@janesnowtoday.com Please put “FOOD” in the subject line. Jane Snow is the former food editor of the Akron Beacon Journal. Her work has appeared in newspapers nationwide. She has won two James Beard Awards for food writing and has been nominated twice for the Pulitzer Prize. She lives in Akron, Ohio, with her husband, Tony, a sushi chef and owner of Sushi Katsu, an Akron sushi bar.